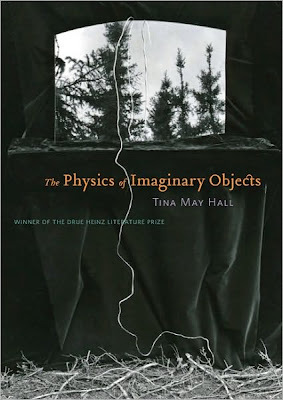 Tina May Hall, The Physics of Imaginary Objects, University of Pittsburgh Press, 2010. "The Physics of Imaginary Objects, in fifteen stories and a novella, offers a very different kind of short fiction, blending story with verse to evoke fantasy, allegory, metaphor, love, body, mind, and nearly every sensory perception. Weaving in and out of the space that connects life and death in mysterious ways, these texts use carefully honed language that suggests a newfound spirituality." Tina May Hall, All the Day’s Sad Stories, Caketrain, 2009. 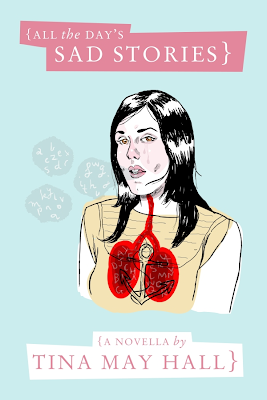 "Tina May Hall’s All the Day’s Sad Stories was chosen by Brian Evenson as the winning manuscript in the 2008 Caketrain Chapbook Competition, and is our first-ever fiction chapbook. With a sharp, careful eye, Hall renders a year in the life of a couple daunted by crises of love, fear, and the uncertain future, one perfectly-crafted sentence at a time. Her attention to detail beyond compare, her syntax rhythmic and resonant, her narrative jutting forth in prose-poetic bursts, Hall paints a world of plastic, everyday modernity in cosmic dischord; a world clearly our own, but with a perspective that turns everything—an egg timer, a cicada, a chalked × on the sidewalk—into signposts of the unfamiliar, alien, and haunted. Mel Stringer’s cover image, a portrait of singer Holly Throsby, was chosen by Hall herself; it’s a perfect fit, suggesting in equal measure the story and the process that brought it to life." "Let’s be upfront about this: I read Matt Bell’s The Collectors (runner-up in Caketrain’s 2008 chapbook competition that Tina May Hall won) first. And in full-disclosure, I loved Bell’s book. It’s a sparkling short text of tunnels and trash, fallen brothers, the sinking down of familial ships, the end of people. So if Bell’s fantastic effort was the runner-up, I had understandably high expectations for the winning novella, Hall’s All the Day’s Sad Stories. And isn’t it lovely when everything turns out as it should? All the Day’s Sad Stories is Jake and Mercy and x’s on doors, x’s and o’s in an ovulation calendar, a dead dog wrapped in a parka, Mercy’s womb the ground they till where nothing springs, hail coming going and the leaves pelted, their lives a shattered album of glass. "Yesterday All The Day’s Sad Stories by Tina May Hall arrived in the mail. My stack of things to read is perilous so I was going to add it to the queue but pink is my favorite color and the cover was so cute that I started reading it and 45 minutes later, I was done, and then I read it again because I wanted to be sure I had read what I just read. The adjective breathtaking is often used to describe things, but while reading this novella, it literally took my breath away. I could not breathe. 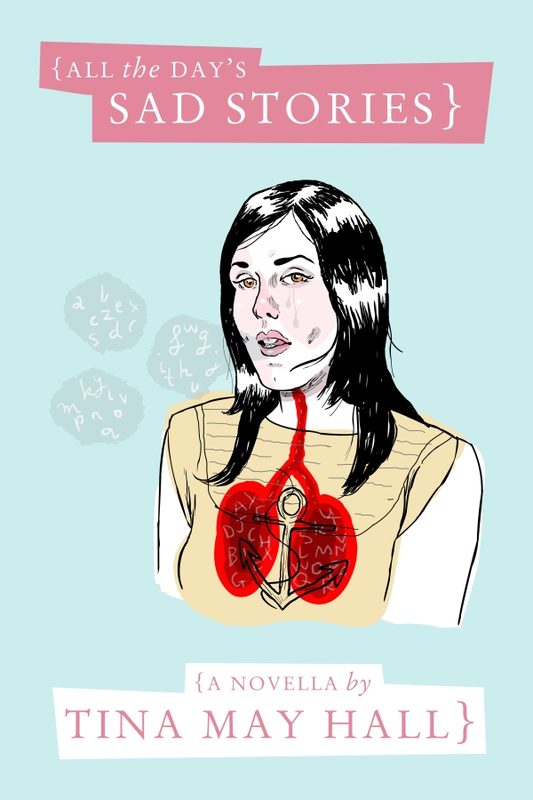 I did not want to breathe because I did not want my reverie to be interrupted by the pesky effort of inhalation or exhalation. This is a lovely lovely book. I so very much wish I had written it. It’s the story of a childless couple, Mercy and Jake, who are dealing with infertility and inertia and detachment and connection. At the same time, this story isn’t about those things at all. There’s are some minor incidents of infidelity between Mercy and her best friend Morris. Jake quits his job teaching history to play poker online full time without even consulting his wife. There’s a dead dog and a mysterious stalker leaving chalk marks on and around Mercy’s home. The idea of absence runs throughout the narrative in a very nicely crafted and almost haunting way. I found the writing to be sorrowful and joyful all at once and the title so very appropriate. I also think that Hall may well be the most observant person in the universe–everything Mercy, the protagonist, sees is so lushly described and in such poetic terms that I am quite certain that there is no detail that goes unnoticed by this writer. I did not want the novella to end. There were so many stunning passages that I would basically have to transcribe the entire book here for you to understand its goodness. I won’t do that but I will leave you with a few because I need you all to know how good the writing here is. "Some of these pieces have the strength of standalone pieces (I’m thinking of “Roadside Attractions,” “The Catherines Sew Grandchildren’s Costumes on Their Breaks,” “On the Way Home,” and “In February, Mercy Imagines Summer”) and so I wondered how you put together this book. Did it begin with a vignette, or a series of them, that then developed into a full-length story? Did you have a number of seed ideas that you built on? Did you approach it in a sentence-by-sentence manner? Or was it a combination of all of the above, or something else entirely? - It’s funny you mention “Roadside Attractions” because that is the first section I wrote, and it started like everything I write, with a sentence. Actually in this case, two sentences: “Bone loss, birth defects, mammogram. These are the words that float up to her from the car radio.” From there I just started getting intrigued by this character and also by the idea of things drifting to the surface, whether they were public service announcements or weather reports or tensions in a marriage. I wrote each section separately and with the idea that it would be able to (sort of) stand alone. I usually work very short; in fact, at the time I was writing this, it was the longest narrative I’d ever constructed. So it made it more manageable for me to think in terms of vignette and scene and to use the white space as breathing space—a coping strategy, I guess! The lyricism, not to mention the muted sadness, throughout All the Day’s Sad Stories is reminiscent to me of the fiction of Michael Ondaatje and Anne Michaels. Both of whom are accomplished poets. Do you write poetry as well? Who are some poets that you regularly enjoy? - First of all, thanks for the very kind comparisons—I love both of those writers. I admit I tend toward the more narrative (even if it is skewed narrative) poets—Robert Hass, Lyn Hejinian, Susan Howe, Anne Carson—and fiction from writers who are almost poets—Gertrude Stein, Carole Maso, Virginia Woolf. Some of the fiction I write plays a lot with negative space, even between sentences, so sometimes people take those stories for poems and I’m always honored by the mistake. I used to write poetry and edited poetry for a couple of literary magazines, but really, my poetry is crap. There is something I still don’t quite get about the line and how the shape of a poem works. Whereas, the sentence feels very comfortable for me—I can really play with that form and push it around and relax into it. I wondered about the use of curly brackets in the book. Is it like how it’s used in some programming languages, that is, as a way of enclosing blocks of code? Or like in math, where it denotes a set? Was it a strictly visual or aesthetic thing? - Don’t you love those brackets? I can’t take any credit for them. They were entirely Joseph Reed’s idea. He was meticulous in his editing of the novella, and he is a brilliant designer. It is wonderful to see how the book becomes a collaborative product and how much grace good design and editing can bring to a project. Which writers were guiding lights for you when you first began to write, and then which ones helped to shape and/or hone your style? Who and what were you reading while you wrote this book? Music? Films? - Hmm…definitely Jane Austen, who I read first when I was too young to realize how witty she is (I was shocked when I revisited her in high school and college). Gabriel Garcia Márquez and Jayne Anne Phillips both changed my understanding of what fiction could do. When I’m reading these writers, or someone like Kathryn Davis or Carole Maso (who I mentioned above), I get so excited about what they are doing to fiction that I actually have to stop reading and catch my breath sometimes. As for writers I have actually worked with, I have to credit Trudy Lewis for keeping me on track and demonstrating a level of care and attention to detail in her own stories that inspires me. When I was writing the novella, I was reading and teaching Don DeLillo, and it is quite clear to me how much I was affected by his work, particularly a certain blandness of affect and the interjections of floating bits of pop culture. I also wanted to ask you some general writing questions. Do have any kind of writing ritual? Are there some mantras you employ while writing. - I have a two-year-old son so my writing ritual is pretty much to type as quickly as possible whenever I find myself alone in front of the computer. I am very prone to stopping sentence by sentence to fiddle until the sound pleases me, so I guess my informal mantras are Keep moving and/or Let it go. But I also try to be kind to myself, and if I only get a couple of sentences written after a few hours working, I tell myself that it will go faster the next time I sit down and I’ll write ten pages at the next sitting, even though I know it is a lie. What’s the drafting and editing process like for you? - As I said above, I work pretty slowly, but I’m always working on three or four projects simultaneously. So I end up with fallow periods where everything is in flux and then bursts of completion. I revise a lot and over time. It seems to be that it takes about a year after I get the first complete draft done before I realize what the story really needs. I wrote the sections in the chapbook over the span of about 14 months and then spent about a year revising them before sending them out. Revising is the most fun for me—I love to tinker and worry about syllables and work the repetition, so undoubtedly I spend too much time on this step. When you mentioned coming up with new titles I remembered that Fitzgerald had considered a number of names for The Great Gatsby like (according to Wikipedia) Gatsby; Among Ash-Heaps and Millionaires; Trimalchio; Trimalchio in West Egg; On the Road to West Egg; Under the Red, White, and Blue; Gold-Hatted Gatsby; and The High-Bouncing Lover. So what were some other titles that you considered? - Oh, most of them are too awful to reveal. But, just to give you a sample, A Year of Small Disasters; Omens Mistaken for the Changing Seasons; Small Graces; and because I am a fan and proponent of the long title, When an Unborn Child Goes Missing, Look to the Fallen Leaf, the Weather Report, the Stolen Kiss, Anything Small Enough to Be Covered by the Hand. So you can see why I stuck with the original title. - I don’t really distinguish (short) lyrical fiction from the prose poem. To me (although I have had heated debates on the topic with colleagues at the campus pub of a Friday), the terms prose poem and short short story (or flash fiction) are interchangeable. By my reading, Woolf and Stein and Maso are fiction writers because they work at length with what seem to be sentences rather than lines and because they claim that designation for themselves. It makes sense to me to think of them as fiction writers precisely because they are “re-envisioning” the form—they aren’t working outside of fiction, but rather on fiction. When you mentioned DeLillo’s influence especially the “blandness of affect and the interjections of floating bits of pop culture” in his work, I immediately saw the parallel in All the Day’s Sad Stories. However, it wasn’t something that was evident to me while reading the text. And while the pop cultural detritus in DeLillo is often wonderfully overwhelming in its exuberant celebration of and obsession with media glut, in your work it’s much more subdued, integrated into the emotional fabric. So how did this happen? Or perhaps I should ask: how are you influenced? After a period of absorption, does a transmutation period follow? Is it even evident to you while you’re writing? What is influence anyway? - I don’t think one can help being influenced. Nor is it something a writer should worry about or try to avoid. One of the pleasures of writing is the feeling of entering a conversation with other writers, and influence is a part of this. That said, DeLillo is such a different writer from me—as you point out, his obsessions are far removed from mine—that I felt absolutely confident that whatever I was doing would be distinct from his project. Sometimes my students will tell me they are afraid to read much because they don’t want to lose any sense of their own originality, and I always advise them to read more (and to read a range of writers) and to write more at the same time so they can learn to recognize their own particular voice. I think when you feel relatively secure in your own voice, it gives you a stable center and allows you to read widely and be thrilled and inspired and still safe in your own work. Gertrude Stein, in “Poetry and Grammar,” famously states: “I really do not know that anything has ever been more exciting than diagramming sentences…I like the feeling the everlasting feeling of sentences as they diagram themselves.” So since you mentioned it, would you diagram some of your favorite sentences and then also talk about why you’ve chosen them? The first sentence is interesting because the use of the nonrestrictive subordinate adjective clause, “This friend of mine from work,” and the embedded additional nonrestrictive adjective clause, “Bud,” is such an oblique way of getting into a story. Also the use of “this” instead of the indefinite article “a” and the “he” (which makes the first clause nonrestrictive) give the sentence (and the story) an instantly colloquial feel. But then he breaks up this kind of circuitous, talky syntax with the simple conjoined declarative sentence, “I didn’t know his wife and he didn’t know Fran,” which is brilliant, not only because it anchors the rhythm on a sentence level, but also because it performs the “evenness” alluded to in the next sentence through its parallel structure. This parallel structure also accomplishes some important exposition—we know by the end of the sentence that Fran must be the narrator’s wife or the equivalent. Following up these two very simple sentences with two sentences beginning with coordinating conjunctions introduces tension into the story because there is some question about which clauses the conjunctions are meant to be joining. Does the “but” complicate the statement that the narrator and Bud are even? Or does it gesture back to the problem of them not knowing each other’s wives? The “and” also seems to indicate that the following statement is problematic somehow, that it has some part in the narrator’s decision to go to dinner. Also, starting the two sentences with the conjunctions eases us back into the colloquial flavor of the story. I won’t go on, but when we do this kind of close analysis in class, it really highlights the control a skilled writer can exert over his or her material. I jokingly exhort students to respect the sentence, but it is true that this is our responsibility as fiction writers. It is our unit of meaning, and too often, its possibilities are ignored or left to intuition and chance. The most valuable exercise might be diagramming one’s own sentences. For instance, when I sit down and diagram part of a story, it becomes very clear to me that I tend toward parallelism in threes and embedded prepositional phrases. Knowing this makes me attentive to overuse of these strategies and gives me an easy place to start cutting when I am revising—I always start with a hard look at the prepositional phrases. Who are some of those writers who have gotten “away with so much exposition?” And how did they do it? - I think a writer like Carver, who is a very voice-oriented writer, gets away with exposition precisely because of the colloquial tone he manages to sustain. For instance, “Cathedral,” a story which really centers on the scenes with the blind man, is set up by a big old chunk of exposition at the beginning of the story which Carver can manage because the voice is so conversational. He draws the reader in by creating the feeling of someone talking just to you. Interestingly, “Cathedral” starts with a sentence constructed much like the first sentence of “Feathers”: “The blind man, an old friend of my wife’s, he was on the way to spend the night.” Again, there is that redundant “he” which instantly signals the tone to the reader. Another story that is interesting to look at in terms of exposition is Tim O’Brien’s “The Things They Carried.” That story is extremely exposition-heavy, but it manages to stay buoyant due to the specificity of detail and the self-conscious conceit of listing. Somehow the listing energizes the exposition, gives the story a source of tension to pull the reader along. It is a great story to examine with students to see how technique can create tension as well as event. The amount of exposition in O’Brien’s story also focuses attention on the few scenes we do get, all of which touch in some way on Ted Lavender’s death, so that Lavender’s death becomes a lodestone for the story, like Lieutenant Cross’s good-luck pebble, the thing the story itself carries. What were some ways that Trudy Lewis kept you on track? I also don’t know her work, so what would you recommend I read as a start?